Thirsties Duo Wraps are completely waterproof yet remain breathable, pliable, and very comfortable for your baby's delicate skin. With the adjustable rise you will only need two sizes from birth to potty. Leg gussets provide advanced leak-proof protection and bindings are super-soft against your baby’s skin. Whether your baby is tall or short, thin or chunky, this cover will keep those messes contained! Thirsties Duo Wraps are the preferred wrap for prefolds or trim fit diapers, such as our Stay Dry Duo Insert diaper. The inside of Duo Wraps can be wiped clean between uses allowing for fewer wraps in rotation and greater affordability. Thirsties is very proud of the fact that all Thirsties products are manufactured in Colorado, USA, by a group of very talented individuals, many of whom are moms who work in the comfort and convenience of their own homes. Thirsties Duo Wraps are a very trim fitting cover. They are the preferred wrap for trifolded prefolds or trim fit diapers. The inside of Duo Wraps can be wiped clean between uses allowing for fewer wraps in rotation and greater affordability. 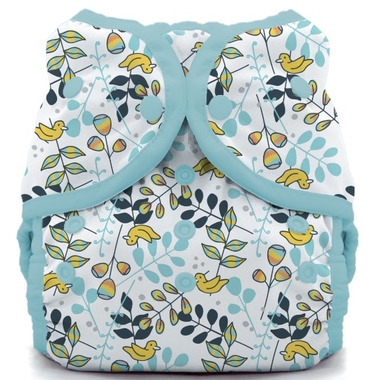 Best of all the covers out there - fits great (even when they're just born and better then the velcro), holds in leaks, and looks super cute! These are perfect for new borns. They form well to the body and I find the snaps more comfortable for the baby than the Velcro. These wash and dry quickly too, I use these daily with my baby. She is four months now and my fifth cloth diapered baby. Fantastic diaper cover, fits well at all snap settings. Really like that these diaper covers have gussets on the legs! Size one says it will fit 6-18lb and is fitting my baby girl now wonderfully. However when she was first born this size would not do and I went with Thirsty diaper covers that came in "newborn/preemie" size and those were perfect for her tiny little thighs.